SOPOWER was originally founded in 2005, with over 10 years of experience in DMS (Design and Manufacturing Service) of power products. Headquartered in Shenzhen of China, SOPOWER is committed to providing high quality products and services to meet diverse customer requirements. all of which can be used to the demanding power market. SOPOWER have 15,000 square meter in-house manufacturing facilities, and an excellent R&D team. We have solid and richly-experienced engineering teams dedicated to product development. SOPWER’s facilities are certified by ISO9001, and its products are also recognized by CE, UL, TUV, ROSH, FCC etc. to assure quality and safety. SOPOWER guarantees reliable product development and consistent manufacturing quality, from raw materials to finished products, and it deeply respects its delivery deadlines. SOPOWER takes pride in its expertise to offer high quality power supplies for all purpose applications. Our professional team is ready to start a new chapter in the global power market. Take quality as core competencies. Maximize customers, partners and employees’ value. Pursue continuous technological innovation. For Quality Management, Environment Safety Management, Occupational Health and Safety Management, SOPOWER has cetified with ISO 9001:2008 , ISO 14001:2004 and OHSAS 18001:2007. 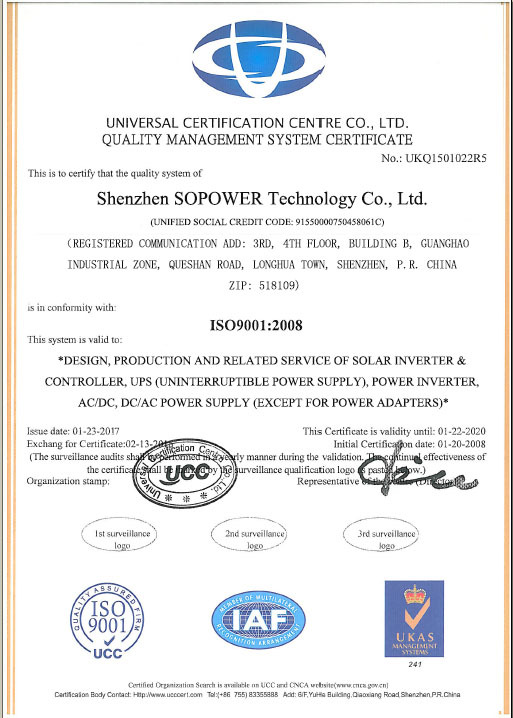 To assure quality and safety, SOPOWER products have certified with CE, UL, TUV, ROSH, FCC etc.